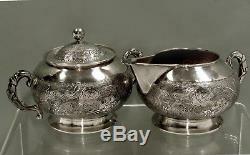 CHINESE EXPORT SILVER TEA SET c1890 SIGNED "DRAGON & PEARL". 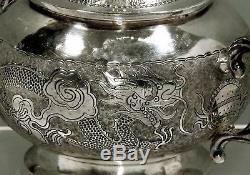 A fine late 19th century Chinese export silver (partial) dragon tea service. 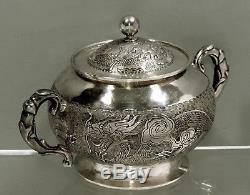 Classic raised circular form, with beautifully hand craved scenes of. Dragons set amidst clouds, battling the the sacred pearl. Here the pearl rendered as a fiery orb. Brushed satin, not quite stippled background. Cover with the original raised globe finial set atop. A single dragon moving in and out of the clouds. Unique leaf wrapped tapering S scroll handles. 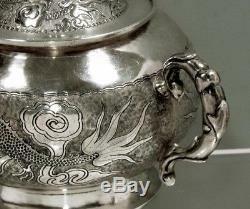 This Chinese export silver dragon covered sugar bowl. And cream jug both are 6 1/2 inches across. 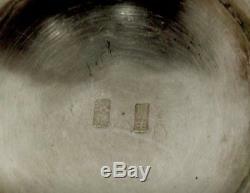 And the set 13 1/2 standard ounces. 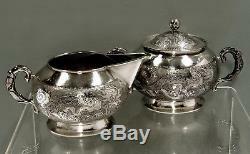 The item "Chinese Export Silver Dragon Tea Set c1890 SIGNED" is in sale since Thursday, September 20, 2018.